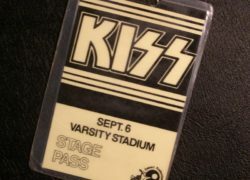 Item description: Extremely rare early laminated Stage Pass for the Kiss 6th September 1976 mammoth outdoor concert held at the Varsity Stadium, Toronto, Canada. Card Stage Pass with black printing on beige. Complete with lamination, and neck hanger gap at the top centre. Condition report: Overall very good to excellent condition. Showing use. Background to Kiss: Kiss (often styled as KISS) formed in New York City in January 1973 known for their hard rock sound. The group consisted of Paul Stanley, Gene Simmons and the band’s original manager, Lew Linet. Peter Criss joined the linup as drummer. Well known for its members’ face paint and stage outfits, the group rose to prominence in the mid-to-late 1970s, with their elaborate live performances, which featured fire breathing, blood-spitting, smoking guitars, shooting rockets, levitating drum kits, and pyrotechnics. The band has gone through several lineup changes, with Stanley and Simmons the only remaining original members. The original and best-known lineup consisted of Stanley (lead vocals and rhythm guitar), Simmons (vocals and bass guitar), Ace Frehley (lead guitar and vocals) and Peter Criss (drums and vocals). With their make-up and costumes, they took on the personae of comic book-style characters: The Starchild (Stanley), The Demon (Simmons), The Spaceman or Space Ace (Frehley) and The Catman (Criss). Due to creative differences, both Criss and Frehley had departed the group by 1982. Kiss has sold more than 100 million records worldwide, including 25 million RIAA-certified albums. On April 10, 2014, Kiss was inducted into the Rock and Roll Hall of Fame. 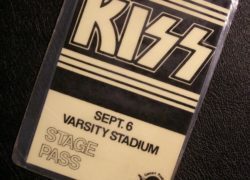 Special notes: The concert at Varsity Stadium was a part of the KISS Destroyer Tour. 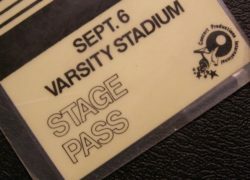 Provenance: The Stage Pass originally belonging to Peter Criss’s longtime drum technician, Chuck Elias. 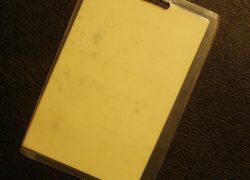 Document of provenance sold together with the pass.